An incredible canine reminded everyone why dogs are known for their loyalty and athleticism, when Arthur the dog traveled hundreds of miles through the Amazonian rainforest to stay at the side of his newfound friends. The story begins in Ecuador when a Swedish team of adventure athletes competing in the Adventure Racing World Championship made an act of kindness that would change their lives forever. Mikael Lindnorn, of Sweden’s Peak Performance team, shared a meatball with the pup before starting a stage of the 430-mile endurance race. 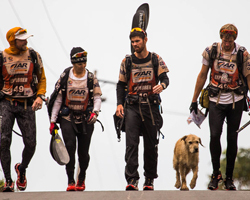 The dog, who was injured and alone, followed the team through the remaining stages of the race, even swimming after their kayak in a leg of the race everyone was sure would force them to part ways. The adventurers fell in love with Arthur and, after finishing the race, went to extraordinary lengths to bring him home. Earlier this month, Arthur arrived in Sweden where he is currently residing in the dog quarantine in Stockholm. Arthur will adjust to his new settings there for 120 days, receiving visits from the athletes until Mikael can take him home. In the meanwhile, the members of Peak Performance have created the Arthur Foundation, a non-profit aimed at helping stray dogs everywhere. A Swiss animal protection group is petitioning to put an end to the practice of consuming domestic animals. The practice is rare, with estimates between 1-3% of the Swiss population accused of secretly eating dog or cat and no reliable sources cited for any given estimate. According to NBC News, a petition with 17,000 signatures has been submitted to the Swiss parliament requesting legislation be produced to officially ban the practice. Though it’s not clear that the practice of consuming cats or dogs is still commonly occurring even in 1% of the population- 1% would still amount to approximately 80,000 people. A 2012 report in a Swiss newspaper stated that the practice was a "cultural matter", related to a period of famine in the nation in which food was scarce. In any event, Swiss agriculture laws currently do not offer protection for pets- meaning this campaign could lead to stronger pet’s rights in the country. This Thanksgiving, Today honored Lucca- a German Shepherd Mix- for her heroic service in the United States Military and for her loving attitude at home. While in the military, Lucca was trained by Staff Sgt. Chris Willingham to sniff out explosives before they had a chance to injure or kill Marine service men and women. Lucca performed these duties on more than 400 missions in Afghanistan and Iraq, weathering firefights and explosions throughout six years of service. While Lucca served most of her time with Willingham, when he was reassigned, Lucca was left under the care of Cpl. Juan Rodriguez. 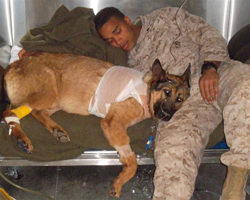 In March of 2012, tragedy struck when Lucca detected not one- but two IEDs, alerting soldiers to the situation before the resulting explosions left Lucca with grievous injuries.Rodriguez came to her aid and helped keep her alive, but Lucca lost her leg and her military career came to an end. Now, Lucca enjoys a quiet life at home with the Willingham family where she still gets visits from Rodriguez, whose life she saved and who saved her life in return. 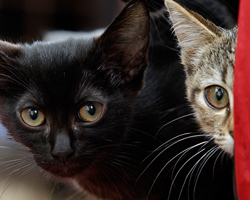 In observance of Feline Diabetes Awareness Month, Catladyland published an important post to help cat owners recognize the disease in their pets so that they may help their cat seek treatment and get healthy before the disease becomes too serious. Diabetes can be dangerous if ignored, but it can also be harmless if it is treated properly. 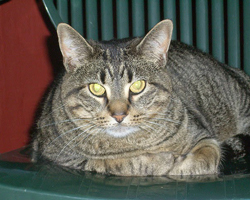 This is why recognizing the disease in your cat is of the utmost importance. Catladyland observes some of the most common symptoms of the disease: frequent urination, increased thirst, increased appetite, weight loss, listlessness, and vomiting or diarrhea. The post also includes the cause of the disease and some ways of treating it. Though this post was rather serious, many of catladylands posts are light-hearted. The blog's author, Angie Bailey, is actually releasing a book of her more comedic material called Texts from Mittens in March 2015, which we encourage you to check out! Did we miss anything this week that you thought was a big deal? Let us know what you think of this weekly recap in the comments section below! And if you missed last week’s recap- you can check it out here.